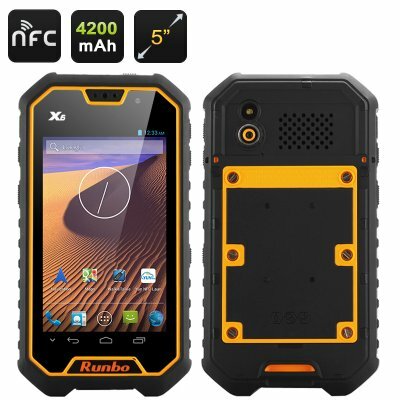 Successfully Added Runbo X6 Rugged Smartphone - IP67, Quad-Core CPU, 2GB RAM, 5 Inch 1080p Screen, Walkie Talkie, Gorilla Glass, NFC (Yellow) to your Shopping Cart. The Multi-Function Runbo X6 is a Rugged 3G Smartphone with a Quad-Core CPU and a 5 inch 1080P Screen thats protecte by Gorilla Glass II. 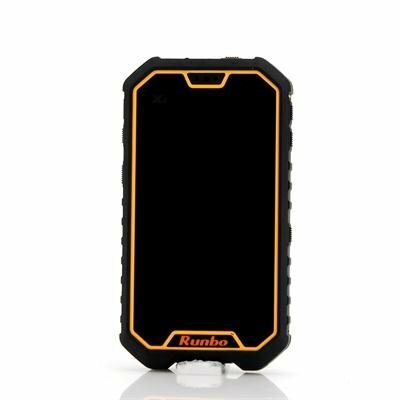 The first thing you would notice about the Runbo X6 is it s size. When compared with other rugged phones such as the Runbo Q5 you immediately see that the X6 is larger. This is because unlike most of its competitors the Runbo X6 has a 5 inch touch screen that displays in HD 1920 x 1080 resolutions so you get great quality visuals. Additionally the screen has Corning II Gorilla Glass so it’s well protected against damage. This large screen rugged phone has an IP67 rating and to get this accreditation it was arduously tested by being submersed in up to 1 meter of water for 30 minutes, so it’s waterproof and dust proof. What’s more, that tough rubberized outer shell makes it shock proof so it’s able to withstand the gruelingly challenges of working in the great outdoors, be it on a construction site, mountain side or wetlands this tough phones hardy exterior will keep it safe. The GPS features will allow you to pinpoint your location so you will never get lots thanks to the GPS and AGPS functions. The Walkie Talkie feature operates across a UHF 400 to 470MHz range making it ideal for using where there is no telephone reception so you can still communicate up to 2 kilometers, which makes this phone popular with outdoor enthusiasts, agricultural workers and those working in rural settings. You can specify the county and select your desired frequency which can then be saved to one of the phones several preset channels, therefore chatting to several people at once or individually is possible. With a 1.5GHz MTK MT6589 Quad-core processor, the Runbo X6 can easily meet your daily use requirements and because of the 2GB of RAM, you get a very good overall performance. With 32GB of on board memory and a micro SD card slot allowing for a further 32GB for a massive total of 64GB of storage. Additional features include front and rear 13 megapixel cameras for quality pictures, Bluetooth 4.0 and NFC for easier file transfers or connecting to a wireless headset, and 2 SIM card slots for handling two different numbers.